We have a month left to fish the Ranch. I would suggest if you have some time to get up here and get some great dry fly fishing in before it closes. The hatches have been very good and you will find plenty of good sized targets. You will see clouds of midges and also blue wings. There are still some mahoganies around as well. Pay close attention in the Ranch. I have watched fish in water that barley covers their backs right along banks that most folks are not giving a second look at. I have witnessed pods of large trout out in the middle of the river as well. One thing that has also very entertaining are the large schools of white fish that feed their way up the river. Almost every time you see a large pod of white fish eating you can bet there will be a large trout right in the middle of all them eating everything in sight. The challenge is to get your fly to the trout before a whitey gets it! The Box has not changed much. Flows are about perfect for wade fishing and fishing has been consistent. I don’t have much in the way of new information as far as patterns go I would stick with the small beads heads, #16 and #18 brown or black zebra midges. I also like cocktail nymphs, lighting bugs and two bit hookers in the same size. As you get down toward the take out look for fish eating blue wings and midges. We have run a number of guide trips on the lower river this past week and I have noticed that our customers and guides both have come back to the shop with smiling faces! The lower river has been very good. 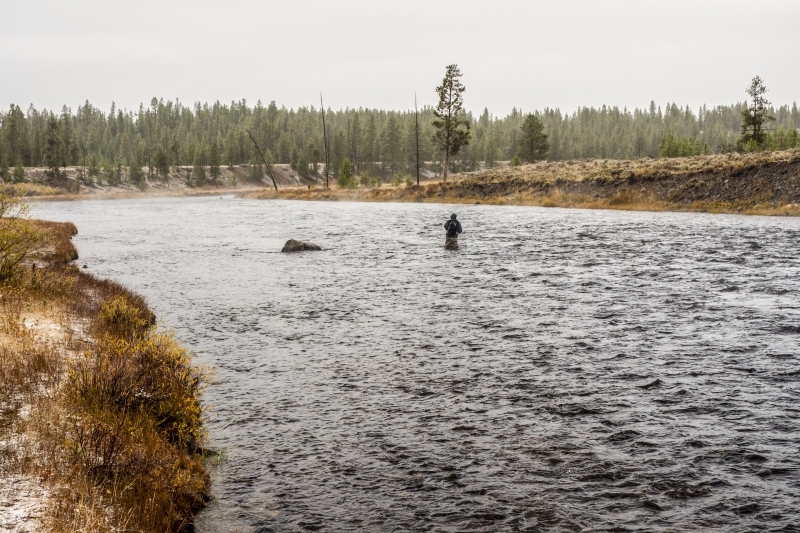 There are many different options on the lower Henry’s Fork. 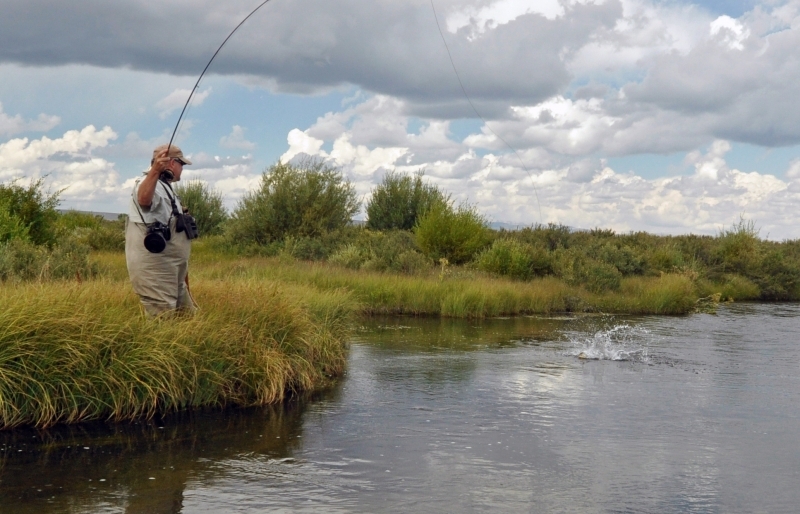 If you want to fish to rising fish then focus your efforts in the back waters . The Fun Farm and the Chester back waters have been very good. Look for blue wings and midges. A #18 or #20 No-Hackle will do the trick. I like hackle stackers and compara duns as well. I would have Griffith gnats in the same size. The same small bead heads that I mentioned above will do the trick. If you want to get in the trout spey game the lower Henry’s Fork is a great place to swing streamers. A Montana intruder swung in one of the many runs that can be found on the lower river can be very productive and is a exciting way to fish. The take’s are heart stopping to say the least! 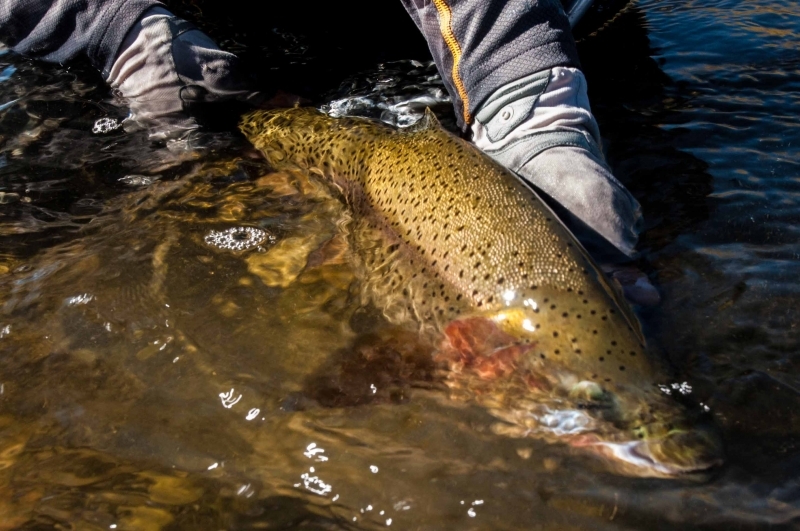 The word on the street is a 25” rainbow was caught on the Teton this past week. I can neither confirm or deny said fish. I can confirm there are some very large fish in the Teton so I am not surprised to hear this. It’s a great time of the year to find theses larger fish. I would think a streamer run on the Teton would be a great idea. Go armed with Zonkers, Cheech leeches and little Kim’s. Sculpzillia and wool head sculpins are also be a good idea. Regardless of what section your doing I would have blue wings as well. AS far as nymphs go not much has changed. The same small beads will serve you well. I don’t have new information for you on the South Fork. I would guess that the brown trout will start digging spawning area’s very soon. Keep an eye out for these areas and be cautious to not walk through the next generation. I would have the usual bead heads and blue wings. Look for risers in the back eddies. I would fish banks hard with streamers on the South Fork. The Canyon is in full fall colors. Great fishing and great scenery is what you will find on the South Fork. The Madison also continues to fish well. Once again not much in the way of new information to tell you. Stick with blue wings and midges for dries and the same small beads for nymphing . It’s a great time of the year to be fishing streamers on the Madison. As always make sure you have a good color selection regardless of the pattern you like to fish. Different size streamers is equally important. Seems like the people hatch on the Madison is starting to subside as well. The park will be closed to fishing in 8 days. If you can get away I would suggest getting in there before it closes. I was in the park fishing the Madison last week and believe it or not the Barnes runs were empty of people! It may have been a result of the blizzard and gale winds but I had the place to myself. Crystal zonkers and purple egg sucking leeches will work if your swinging flies and the blue wings have been very good on the right days. 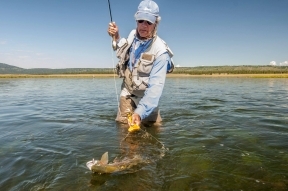 Remember the large fish coming up from Hebgen like to eat dry flies. The Fire Hole and Gibbon are also worth a look and don’t write off the Yellowstone River in the park. Sough creek and the Lamar are also great options if you want to spend a little more time behind the wheel. Once again Henry’s Lake is the place to be. The state boat ramp is very productive. As far as patterns go I don’t think it matters at the state boat ramp. For the rest of the lake I would have scuds and leech patterns. Make sure you have a good color selection.